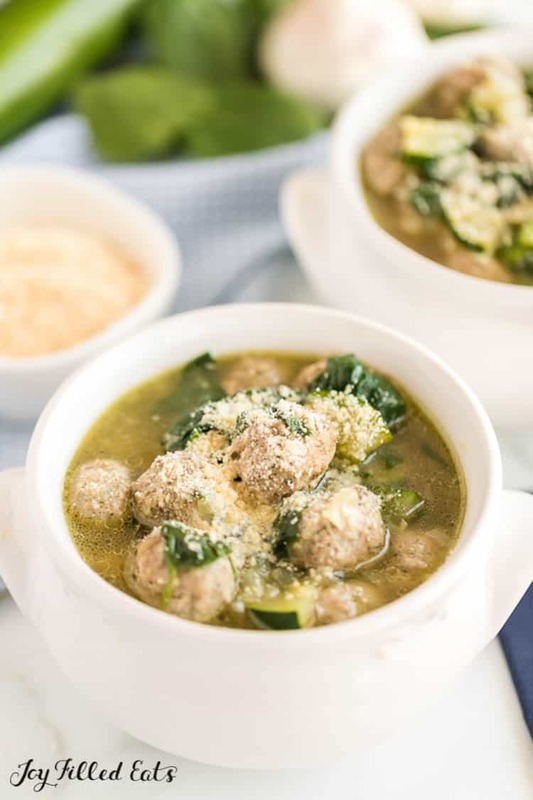 Italian Wedding Soup is a classic and hearty soup that you will want to make over and over again. 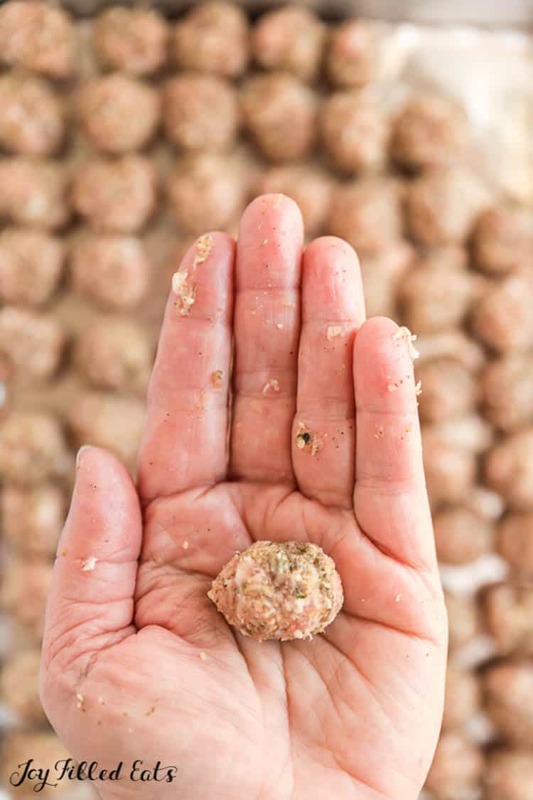 Skip the canned soup, and make homemade Italian wedding soup, or meatball soup today. However you call it, you will love this meatball filled soup that is loaded with hearty vegetables. 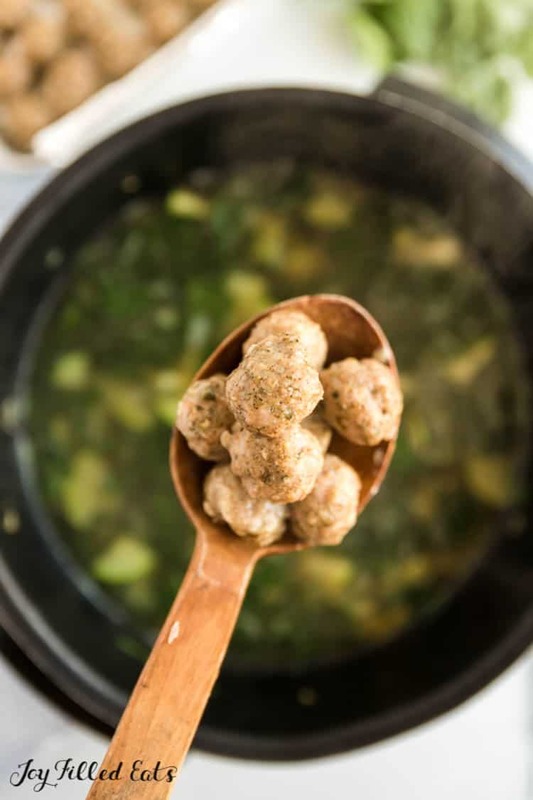 A light but filling Italian Wedding Soup recipe! My friend Lisa posted a photo of her meatball soup on Facebook a few weeks ago, and since then I’ve been craving it. When I got a 1.5 lb pack of ground pork for $2.41 at Walmart yesterday I knew it was time to make some. We are also in the middle of a cold, rainy week here in the Northeast which always screams soup to me. This soup is full of vegetables and meatballs in broth. It is light but filling. Even if you don’t get meat on clearance like I did it is budget friendly. A huge pot shouldn’t cost more than $5-$8. Best of all, it makes a large amount so you will have leftovers to enjoy the next day. 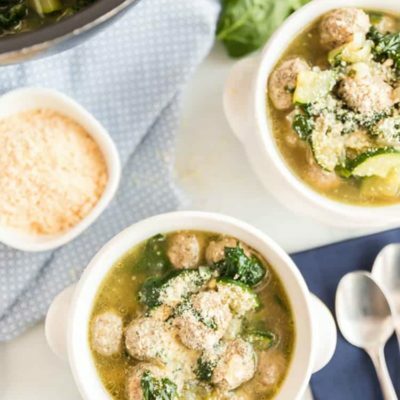 This is the best Italian Wedding Soup I’ve tried. 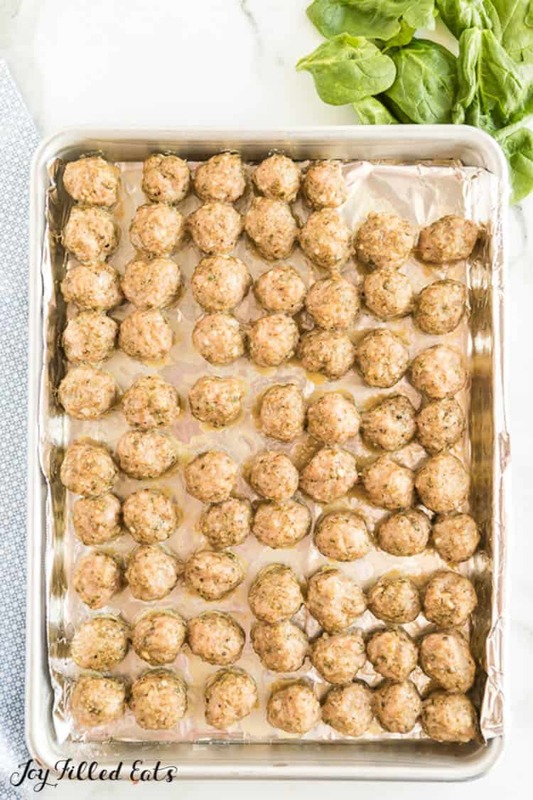 The fresh ingredients paired with the bite-sized pork meatballs have comfort in every bite. It is one of our favorite cold-weather meals. 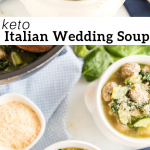 You might think this Italian wedding soup is served at weddings. If you guessed that, you would be wrong. Italian Wedding Soup is named after the way all the ingredients combine and “marry in flavor” as it cooks. You do not have to use pasta when cooking Italian wedding soup. 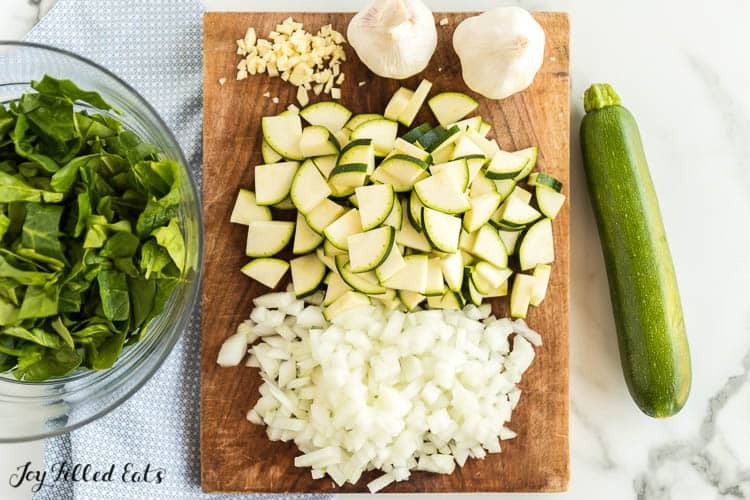 In my recipe, I skip the pasta and use veggies like spinach and zucchini to replace the pasta with wholesome vegetables. It is a lighter version but still packs some incredible taste. I reached for ground pork when making my meatballs. You are welcome to use ground chicken, turkey, or even turkey sausage. All of these meats will work well with the other ingredients used in the meatball portion of the recipe. Start by prepping and cooking your meatballs as directed below. You want to make sure your meatballs reach at least 160 degrees to ensure they are cooked safely to be mixed with the soup. Once your meatballs are done, go ahead and work on the stock of the soup. Add in some olive oil to your pot, and toss in your diced onion and garlic. Cook until soft and fragrant. 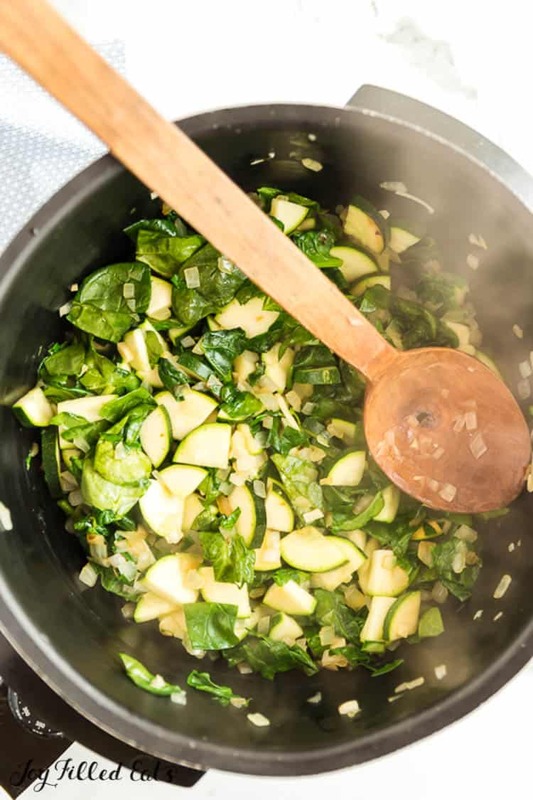 Then stir in your zucchini and cabbage and cover the pan. You want it to break down and cook for around five to ten minutes. Add in your stock, and heat until you see it begin to simmer. Add in your meatballs, and top with parmesan cheese. You sure can! If you don’t want to mess with making homemade meatballs, buy your favorite brand of meatballs in the store. You can use frozen or look for pre-made meatballs in the refrigerator section at your meat market. Both work great in the recipe. I prefer to make my own because the teeny tiny meatballs traditional to Meatball Soup aren’t available in any freezer section I’ve seen. You are welcome to freeze any of your leftover Italian wedding soup. I will say that your veggies will break down a bit more once you go to warm them up. But the flavors will be the same, and it tastes phenomenal. Just place your soup in freezer bags or container and toss in the fridge for one to two months. Thaw in the refrigerator the night before and then warm up on the stove. I like to pour my soup into freezer bags and then lay them flat in the freezer. Once they are frozen, you can set them up, and it uses almost no room in the freezer. This is an excellent tip if you are a meal prepper who enjoys having a freezer full of meals. Most of the time we eat soup alone and don’t pair it with other sides. But if you are on the hunt for some tasty sides to match with this soup, let me share a few ideas below. 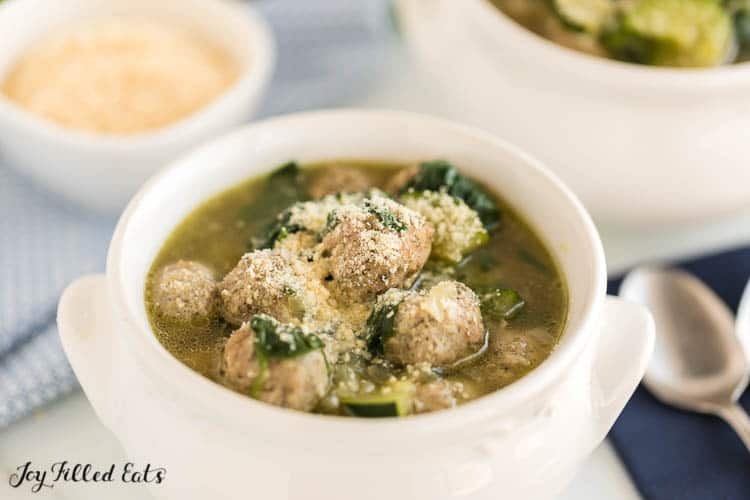 If you are a fan of soup give my meatball soup aka Italian wedding soup recipe a try. It is simple to make, minimal ingredients required and can serve a crowd. Best of all it reheats beautifully for meals down the line. 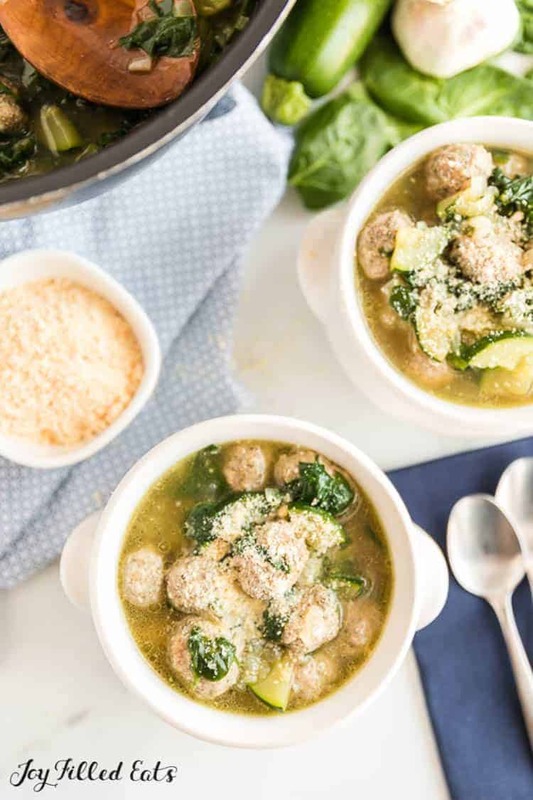 Have you tried making homemade Italian wedding soup before? Preheat oven to 400. 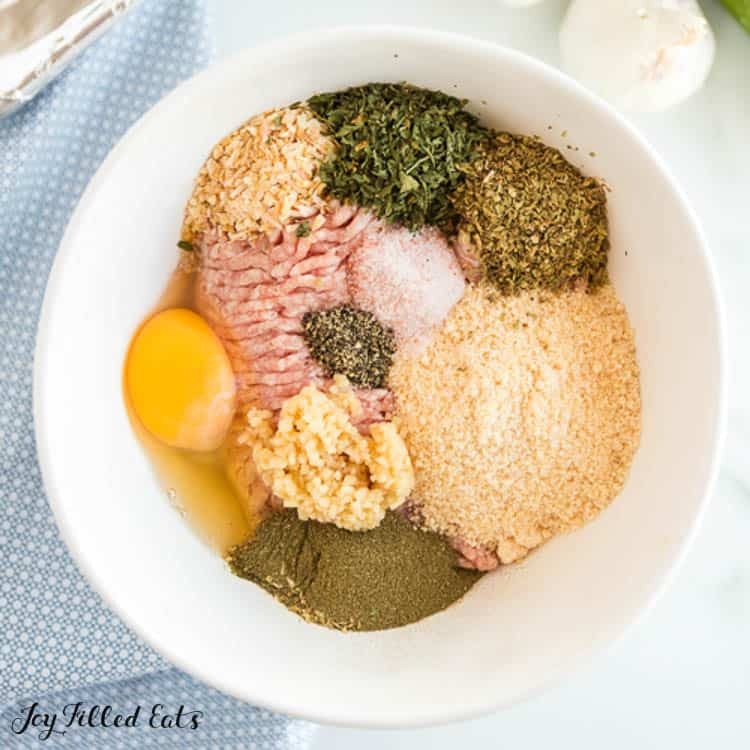 Mix all meatball ingredients together. Form into small balls. Put on a greased baking sheet (I line mine with foil). Bake for 10-15 until a meat thermometer reaches 160. Meanwhile, grease a stock pot with olive oil. Cook onions and garlic until they are softened. Add zucchini and cover. Cook 5 min until softened. Add stock and heat until simmering. Add cooked meatballs and spinach and serve with extra parmesan cheese. Originally Published February 24, 2016. Revised and Republished March 22, 2016. About how many meatballs does this make and about how much is a serving? Trying to figure nutritional value per serving but impossible to do without some idea how much this makes. If I knew the number and size of each serving (like 6 - 1 cup servings) and the number of small meatballs it makes, then I could figure. Thanks so much! Honestly, I'm not sure. I'm sorry. It's been awhile since I made this one and this was before I started calculating nutrition info for all of my recipes. My guess would be 6 servings.